Yes, you read that correctly! I’m offering FREE SHIPPING during EXTRAVAGANZA!! Stampin’ Up! is having their annual Extravaganza Sale November 20th – 26th. On November 20th only there will be several stamp sets offered at a discount along with other merchandise on sale. Again, these stamp sets are only on sale November 20th. Then on November 26th, they will be offering additional products on sale for that day only. I’ll let you know what they are as soon as I know! In addition to this I’m offering FREE Shipping for any orders of $50 or more (excluding tax and shipping) during this time only. You don’t have to order just what is on sale. It goes for ANY Stampin’ Up! products ordered through me. The special offer of free shipping is through me, personally as an independent Stampin’ Up! demonstrator, and is not available through Stampin’ Up! As I’m a Canadian demonstrator, I can only sell to customers in Canada, per Stampin’ Up! regulations. HOWEVER – for my American subscribers – my good friend and Stampin’ Up! demonstrator in the U.S. Susan Horr, is partnering with me in offering this special! That means that if you live in the the U.S. you can take advantage of this awesome sale by placing your order with Susan! To shop with Susan, please go to her website at SUSAN STAMPS. Be sure to use her Hostess Code when you order! When placing an online order AT MY STORE, you MUST USE HOST CODE FXDASWQU . Once I’ve received confirmation of your order shipping, I will refund the total shipping cost to you, by e-transfer. When having me place your order, I will pay for the shipping up front – no other steps needed by you! Remember – these sale items are while supplies last – so your best option is to order online in my store right away – so you don’t miss out! Starting Monday, the entire list, below, is on sale! 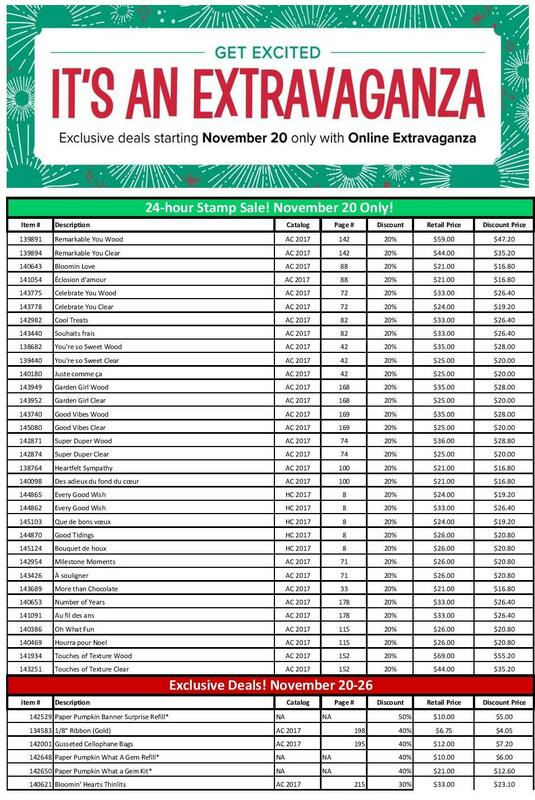 The stamps that you see in the top portion of the list are ONLY ON SALE ON MONDAY, NOV. 20th!! Everything else is on sale for the entire week, through Nov. 26th, while supplies last. 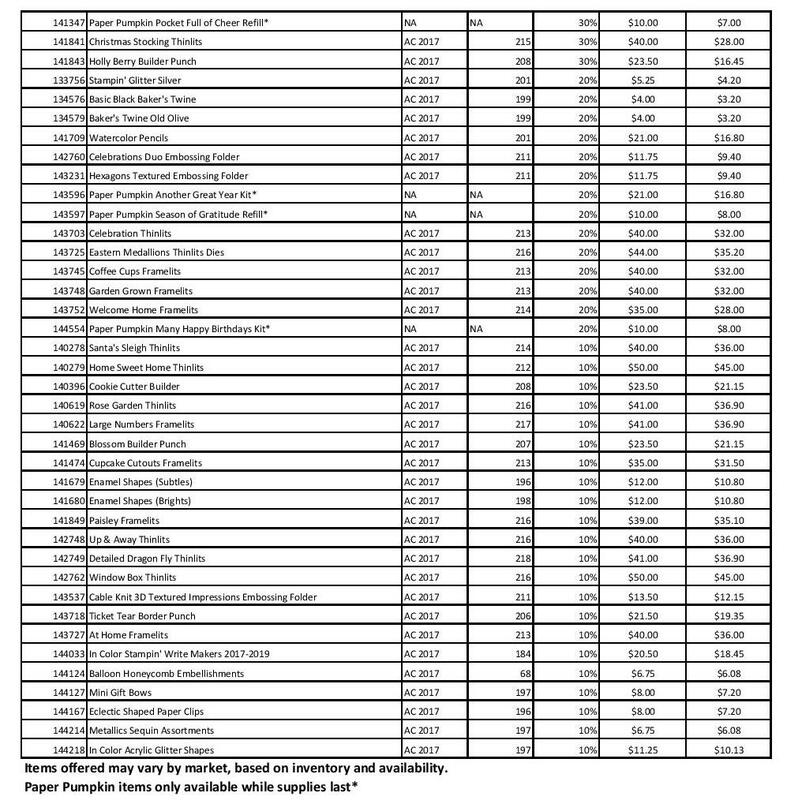 To see the entire list in larger format, CLICK HERE FOR THE PDF. Every order of $50 or more (before tax/shipping) will receive FREE SHIPPING! To order through me, either contact me directly debsmart@shaw.ca with your order, or shop in my ONLINE STORE using HOST CODE FXDASWQU. Previous Previous post: Save on Stampin’ with Online Extravaganza! Next Next post: It’s Happening Today!